When we’re actually motivated to tie up our shoes, get off our stoop, and explore some nearby hiking trails, the last thing we want is to have our moment of communing with nature interrupted by crowds doing the same thing. That’s why we’ll be spending some time outside over the holiday season: so many people get out of town that it’s easier to find some space, we finally have a little down time, and the cool weather means never worrying about overheating. In honor of the 12 Days of Christmas, we present our 12 Hikes of the Holidays. One of the region’s most popular waterfall hikes, Switzer Falls will be looking particularly great after our recent rains. Seize the opportunity to enjoy the 4.5- mile there-and-back hike, which will reward you with impressive sights and a truly out-of-the-city experience, even though you haven’t gone far. For an easy 1.5-mile jaunt with bonkers views of the Pacific and Catalina Island, head to the Palos Verdes Peninsula. The physical effort required is minimal but the visual payoff is maximum, with the holiday weekend only sweetening the spot. Even if you don’t have plans for an extended desert getaway over the holidays, a trek just past Santa Clarita will bring you to this otherworldly area. Follow the Foot Trail Loop or Pacific Crest Trail, depending on your preference. Both will include picture-perfect views of rock formations you might recognize from dozens of Hollywood movies. On a clear day, you’ll be able to see the ocean and all the way to downtown L.A. from this lookout point in Topanga Canyon State Park high above Pacific Palisades. It’s about seven miles to the tippy top of Parker Mesa Overlook, which is admittedly challenging, but it’s worth the effort. 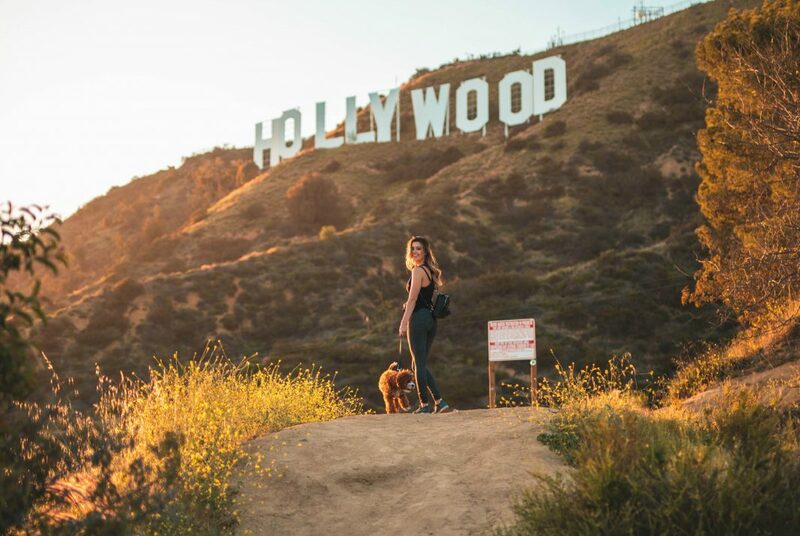 Normally slammed with tourists seeking iconic Hollywood Sign photo ops, many locals have never bothered to take the walk themselves. There are multiple approaches, but the most popular starts at the Charlie Turner Trailhead and ascends through the pine grove known as Berlin Forest. Once you reach the top, the views are true stunners. If your legs just can’t take the idea of a seven-mile climb to the Parker Mesa Overlook, consider the abridged version, aka Los Liones Trail. After 1.3 miles and 550 feet of elevation, you’ll end up at a scenic plateau with a bench, where you can catch your breath or contemplate your existence. Less a hike than a walk (or bike ride, if you wish)–a pretty long one at eight miles, round trip–the Strand stretches from the Manhattan Beach Pier to the Redondo Beach Pier. Along the way, you’ll have a stellar view of the ocean, plus options for plenty of food and drink pit stops. This path may be only a bit over two miles, but with viewpoints at an elevation of 975 feet, your life is going to get sweaty fast. One perk of finishing it: When you reach the top, there’s a cute seat to relax in before starting the trek back. Thighs will cry out; calories will burn; Instagram dreams will come true. Echo Mountain, where this trail leads you, was a popular resort area built in the 1890s, with a tramway that dropped visitors at the top. Both the resort and tram are gone, but if you want a hike that’s a bit more challenging than some on this list, hit the nearly six-mile (each way) trail that gains 1,400 feet of elevation (it’s a mountain, after all). Often super popular, this Pacific Palisades hike is 2.6 miles, but you can choose your own adventure and follow offshoot paths if you want to extend the mission. The elevation gain is about 860 feet, if you follow the Ridge Trail portion, or make it an easier out-and-back by sticking to Canyon Trail’s flatter ground. A trip along Eaton Canyon Trail is mostly pretty level and wide–until you hit the narrow, single-file half-mile path winding up 375 feet through a narrow canyon. If you’re OK with that, you’ll be rewarded with a perfectly picturesque 40-foot waterfall. Even if you’ve hiked around Griffith Park before, you may not have taken the route that leads to Bronson Cave. The man-made “cave” (really more of a tunnel) was a popular filming location in the 1960s, including standing in for Batman’s Batcave on TV. Next articleWhy Can’t People Get Enough of Made-for-TV Christmas Movies?